by jessicasabo September 24, 2018 January 14, 2019 . 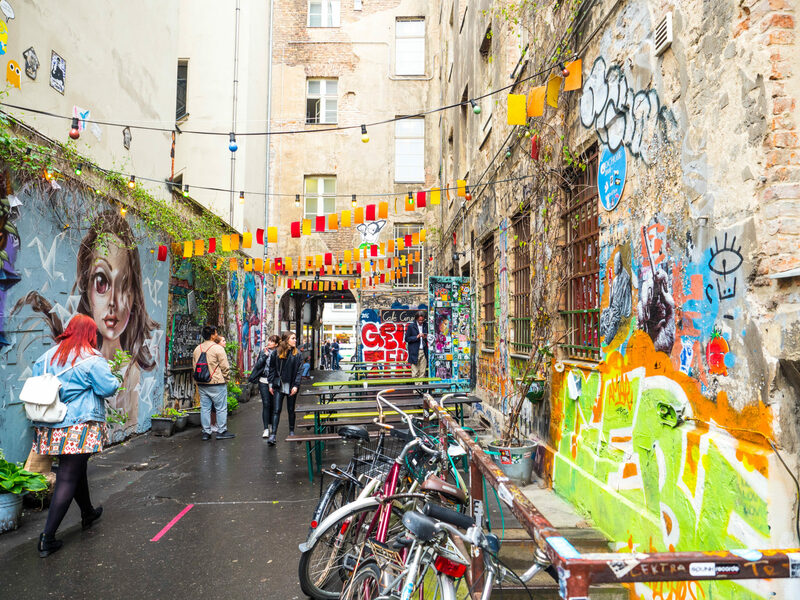 Three words that I would use to describe Berlin: eclectic, alternative, diverse. 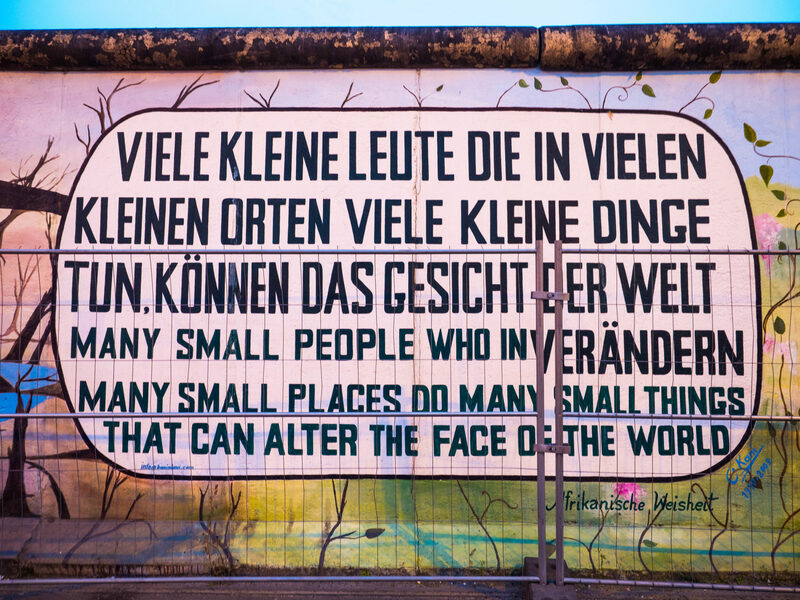 I find it hard to believe that the Berlin wall was still standing when I was born and wasn’t demolished until 1989. 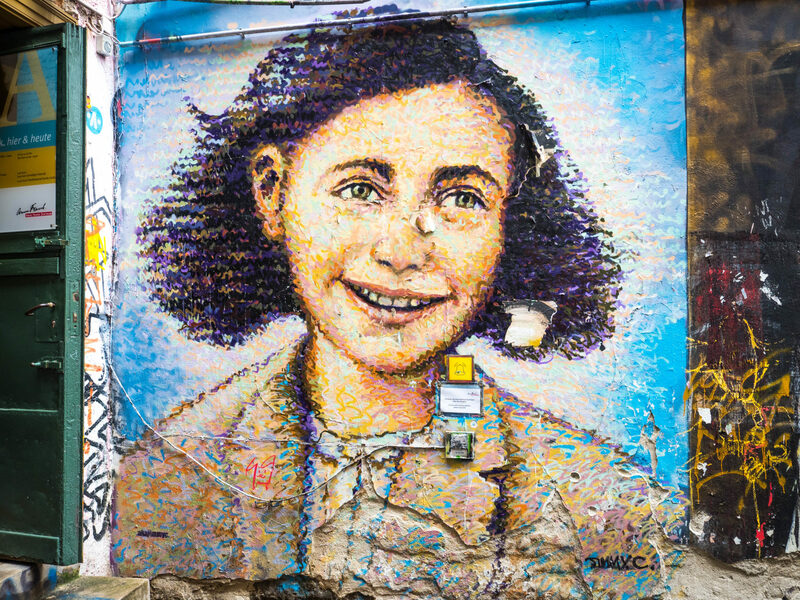 The effects of World War 2 (WW2) and the Cold War can definitely be seen and felt as you’re walking around this city. 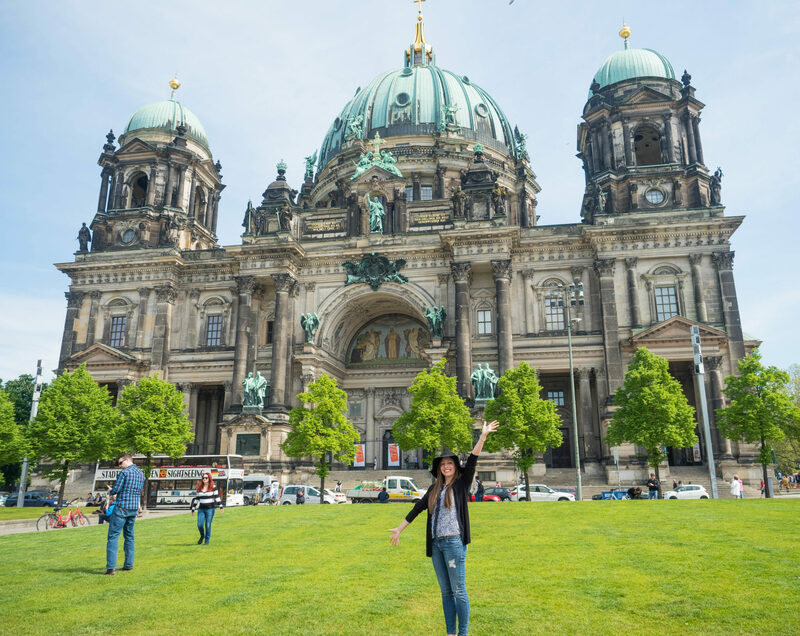 I spent about 4 days in Berlin during my trip, and I’ll admit that I didn’t really like it at first. But by the end of our stay, I really came to love it and appreciate the city for what it has to offer. 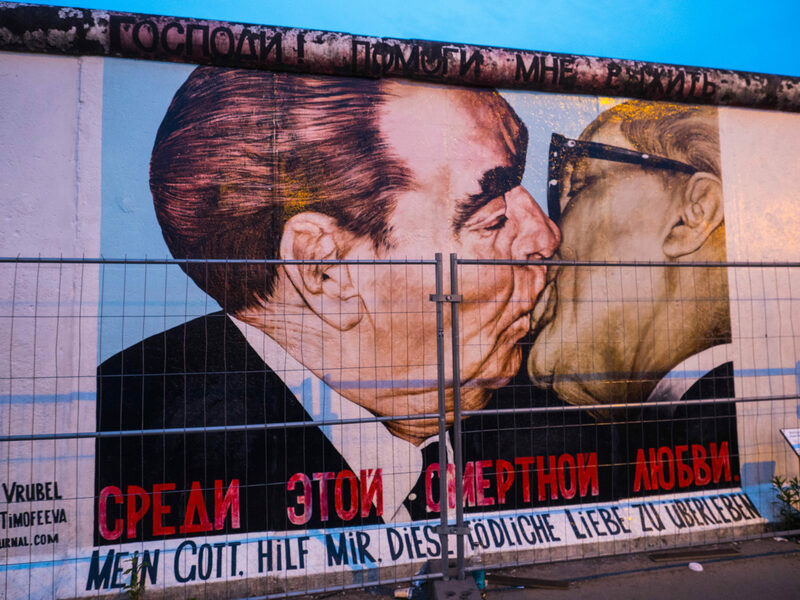 In Berlin, anything goes. You can really be who you are without judgment. From Amsterdam to Berlin via train, it takes about 6.5 hours depending on the number of stops. 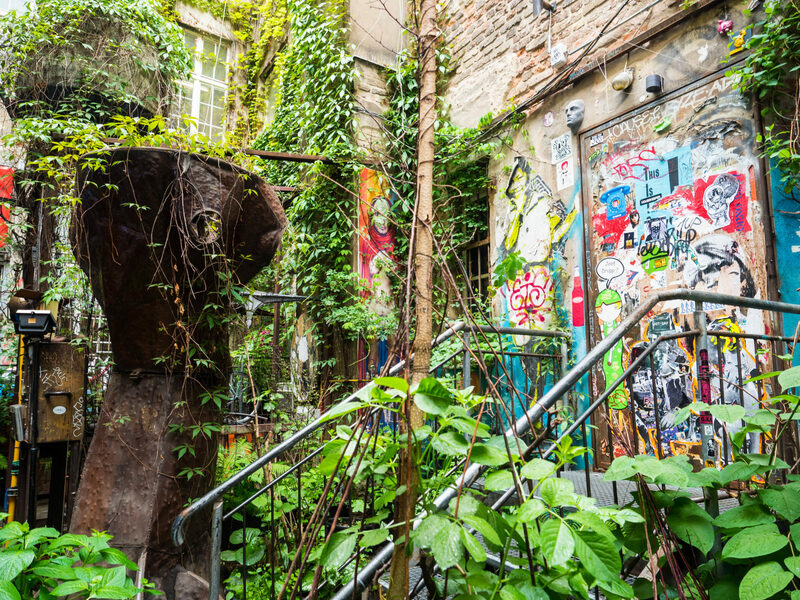 We stayed in the A&O Youth Hostel in Kreuzberg as part of the organized tour I was on with Geckos Adventures. The Euro (EUR) is the official currency of Germany. The exchange rate at the time of this post is 1.00 USD = 0.86 EUR. 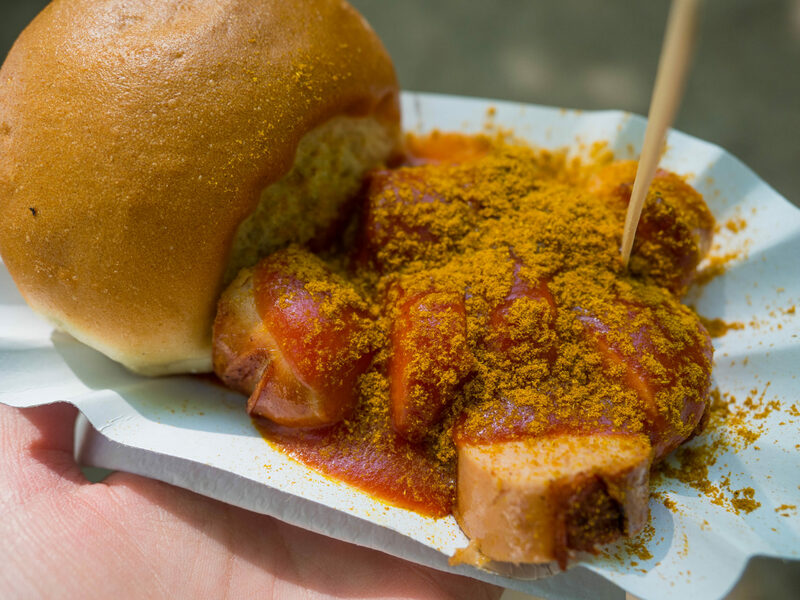 The first thing we did after arriving in Berlin from Amsterdam was go on the search for food. 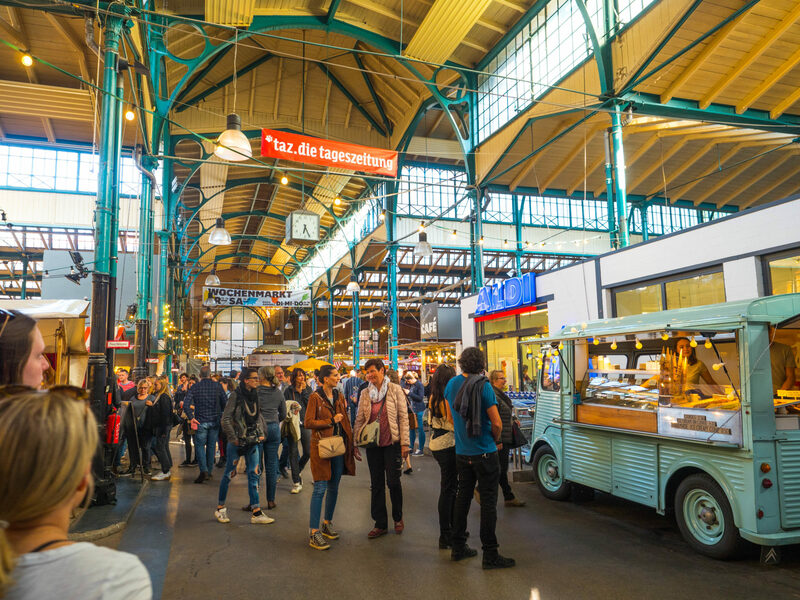 I highly recommend this indoor food market that our tour guide suggested. It had food, desserts, and drinks from all around the world. Tons of options! Opening hours: It’s open Monday-Saturday from 12:00 pm to 6:00 pm, open from 10:00 am on Saturday and till 10:00 pm on Thursday. Closed Sundays. 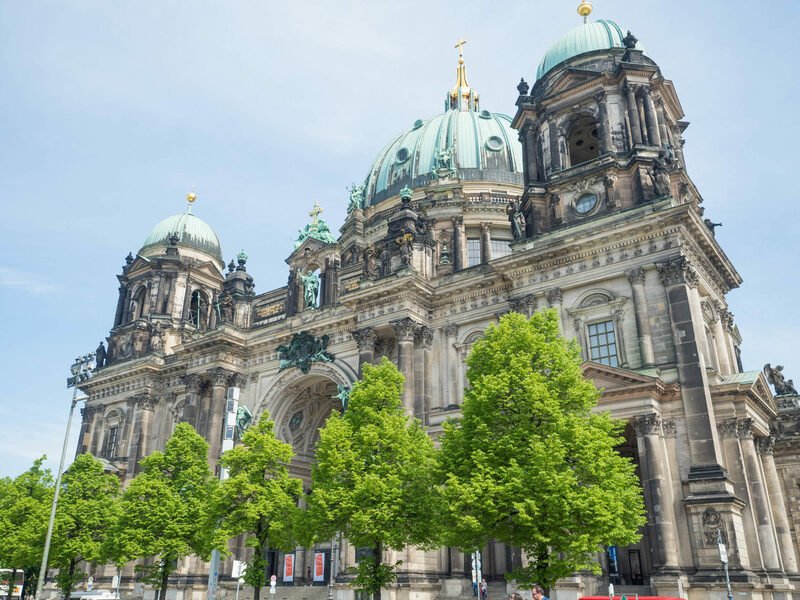 Located on museum island in Berlin, this cathedral is a must see. The building was built in 1905, but was damaged during the bombings of WW2 and refinished. Opening hours: Open seven days a week, hours differ by day/season. 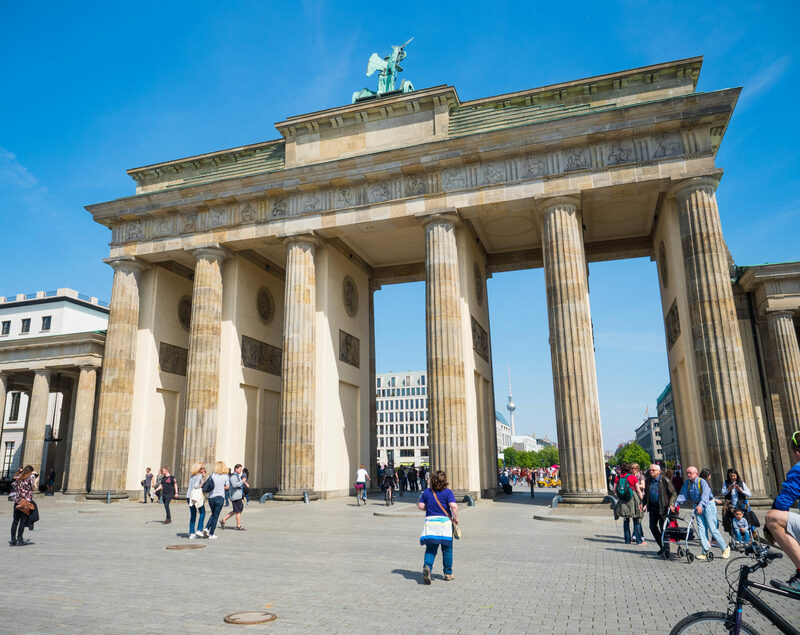 The Brandenburg Gate is a famous 18th-century monument in Berlin. During the Nazi rise to power, it became a party symbol. 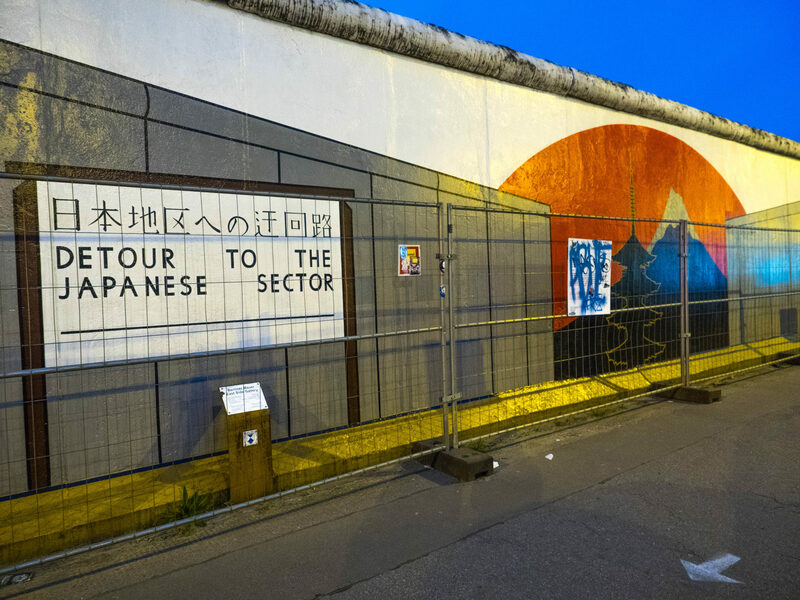 It was then badly damaged during WW2 and was not restored until after the Cold War ended. Now it stands as a symbol of unity and freedom. 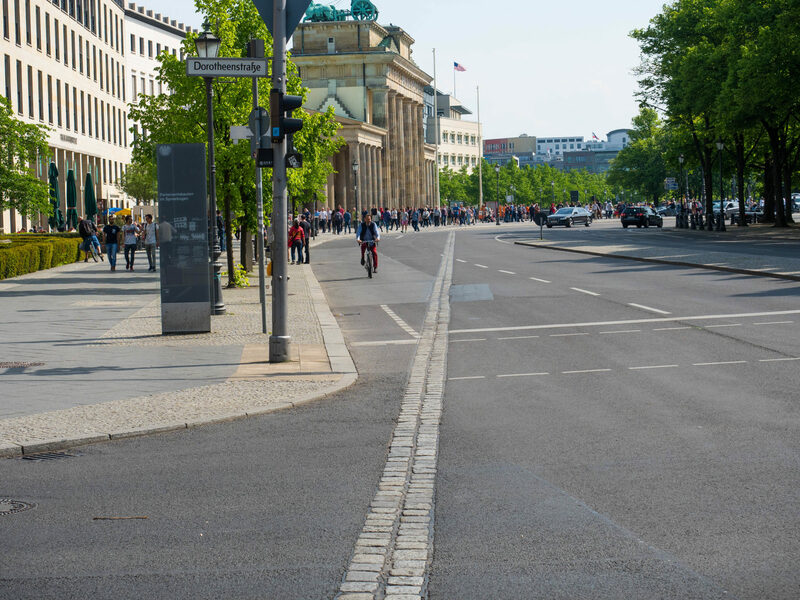 Directly behind the Brandenburg Gate, I noticed a line running directly down the middle of the street. I had no idea what this was, and my tour guide had to inform me that it was the line to represent where the Berlin Wall once stood. I can’t even comprehend what life in Germany was like during that time. 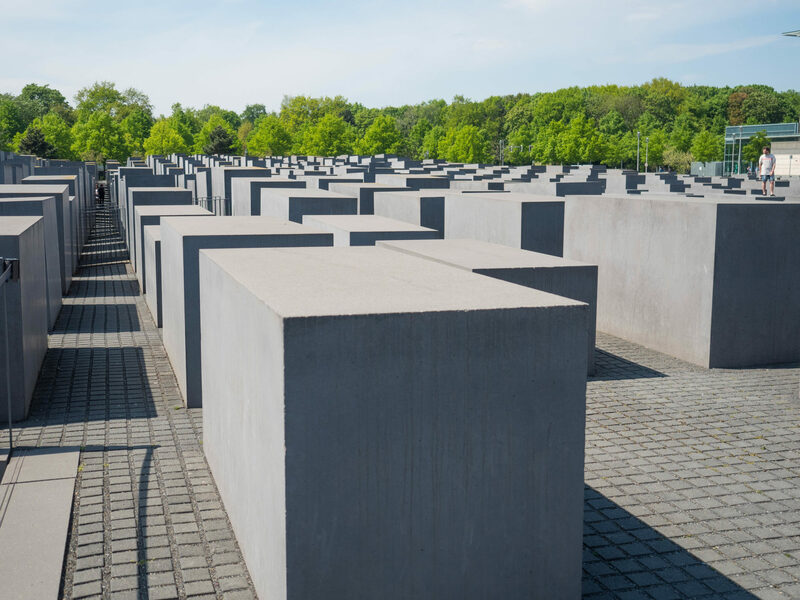 This memorial was inaugurated in 2005, 60 years after the end of WW2. There is an attached building with information and the names of 3 million Jewish Holocaust victims. It’s a very sobering experience, but something I definitely recommend checking out. The pictures and stories are something I will never forget. 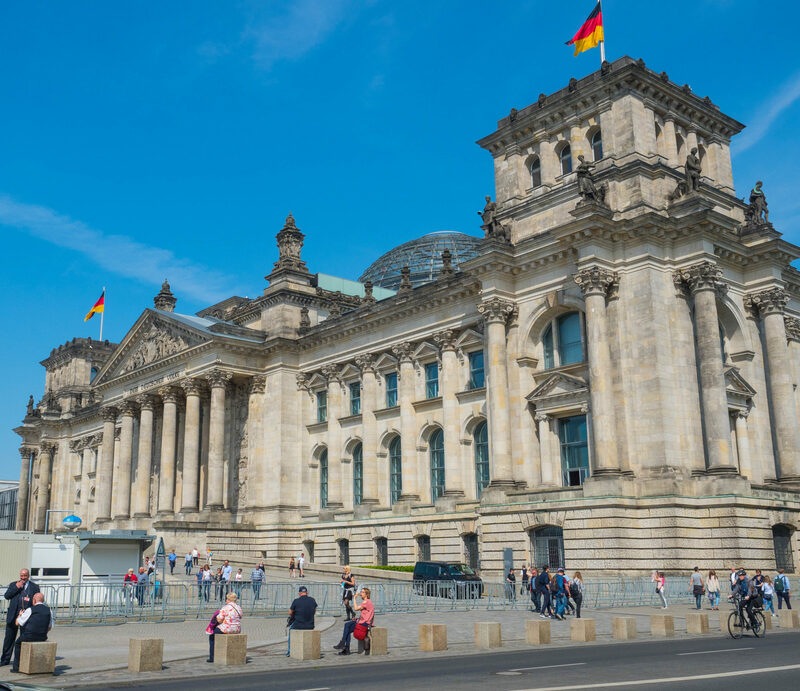 The Reichstag building is home to the German parliament. It was opened in 1894 and was damaged by a fire of unknown origin in 1933. It was then further damaged by the air raids of WW2 and was not fully restored until after the Cold War in 1999. The new glass dome was constructed to represent the transparency of the government in allowing the public to peer into the chambers below. There is even a restaurant inside now. Opening hours: From 8:00 AM to midnight. Admission: Free. But you have to register in advance to visit the dome. 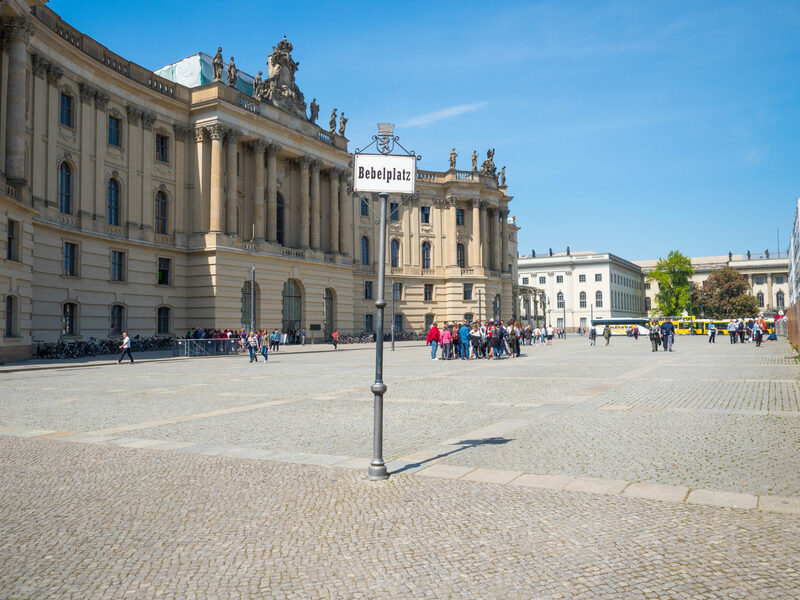 This public square is remembered as one of the sites of the Nazi book burnings in 1933. They burned around 20,000 books. 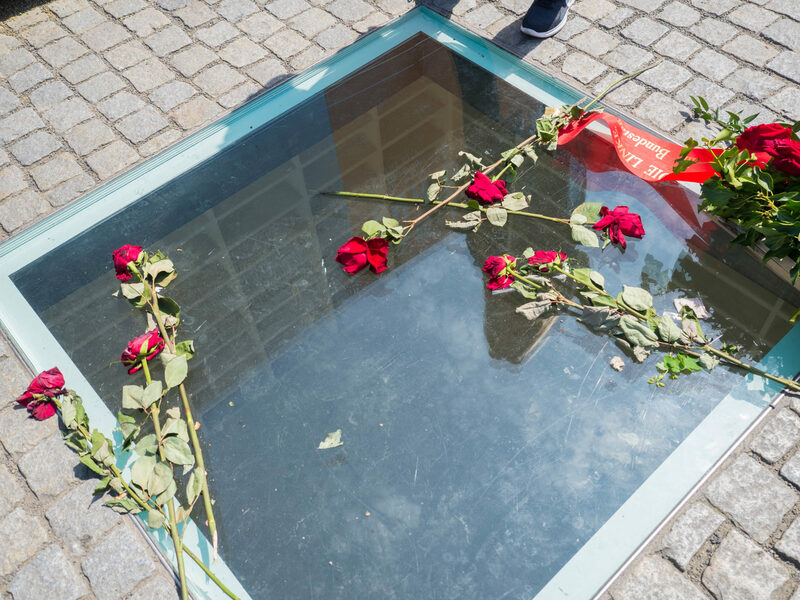 Today there’s a memorial in the center of the square consisting of a glass plate looking down into empty bookshelves. 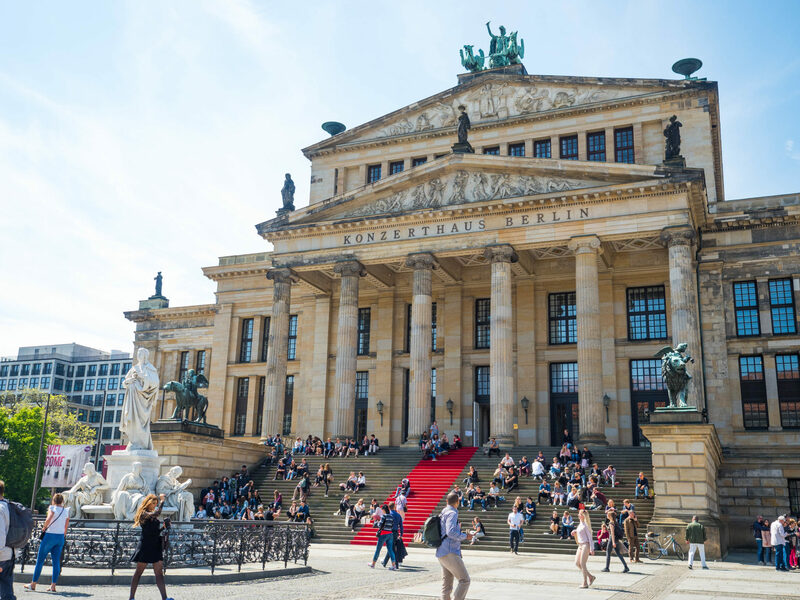 This concert hall now houses the German orchestra. 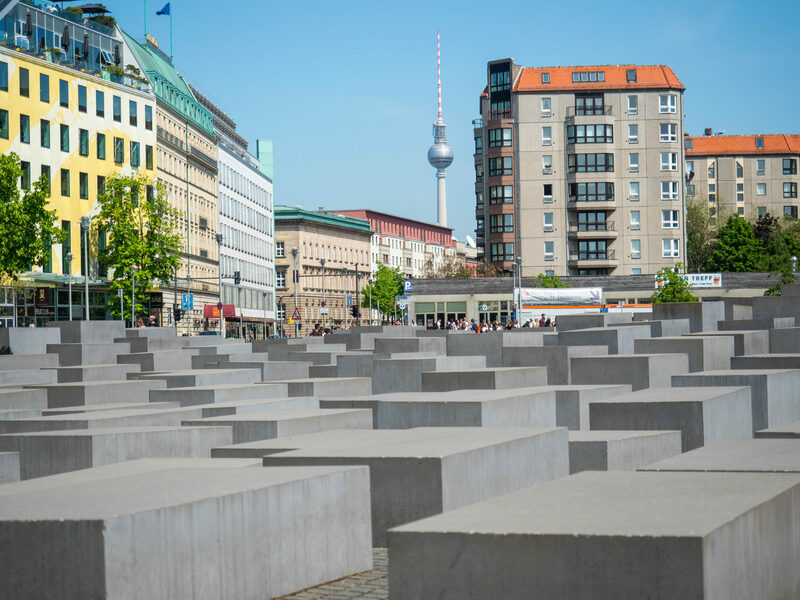 It was badly damaged during the bombings and was rebuilt in 1977. 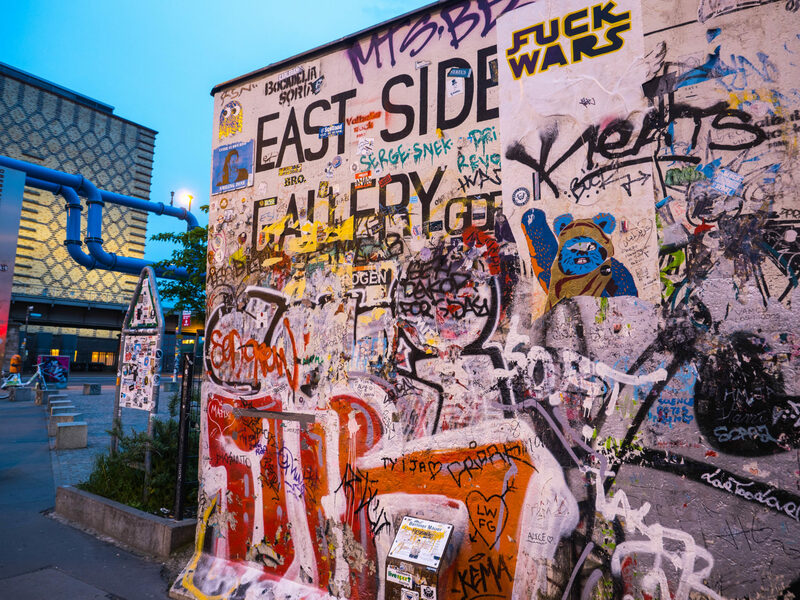 This gallery consists of a series of murals painted directly on the remnants of the Berlin Wall. 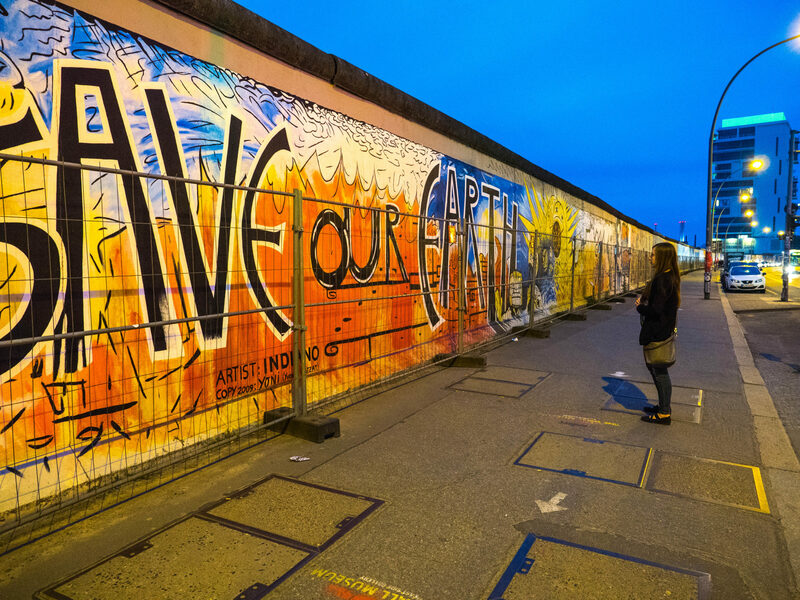 It was painted in 1990 by artists from all around the world, and is now a heritage protected landmark. This free walking tour is definitely something I recommend doing if you’re interested in the more contemporary and modern side of the city. 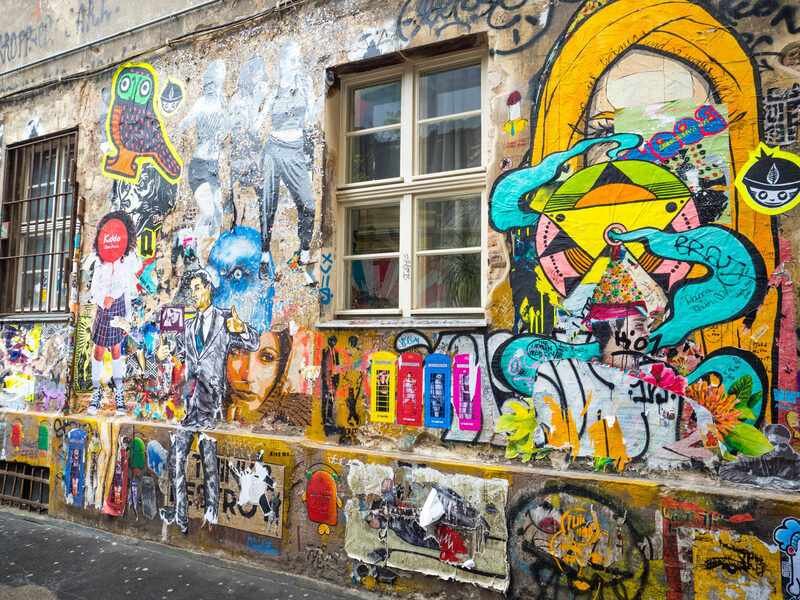 Street art and graffiti are huge in Berlin, and I’ve never seen a city with so many murals and street paintings. It was pretty cool to hear some of the stories of the local street artists, and their signature styles. Hours: Daily at 11:00 AM, 1:00 PM, and 3:00 PM. Tours usually last around 3 hours. Admission: Free! 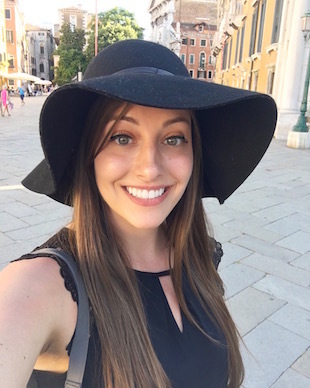 These tours are based on tips, so pay what you want. You’ll see a repeat of this style all over the city. The people dancing are real, and printed from a photo. 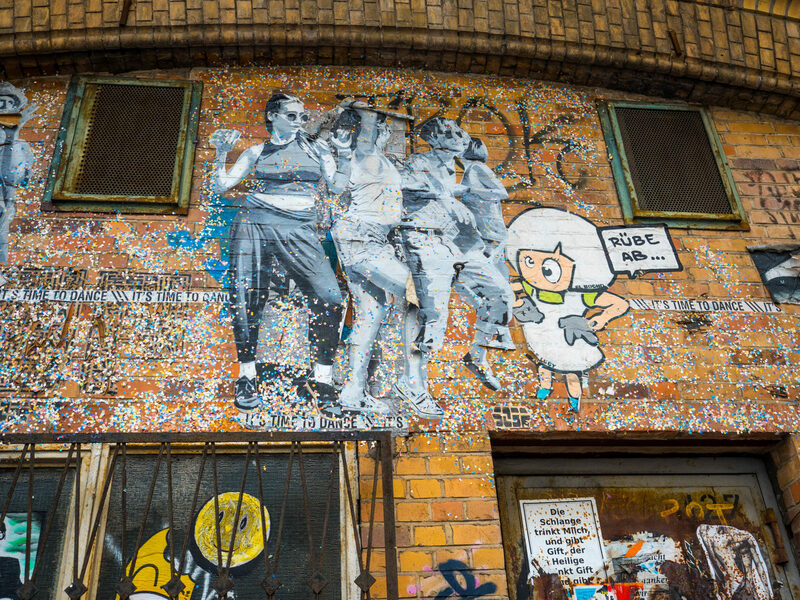 The artist will pre-arrange his/her work and then paste it up and throw a bunch of confetti around. Trust me. 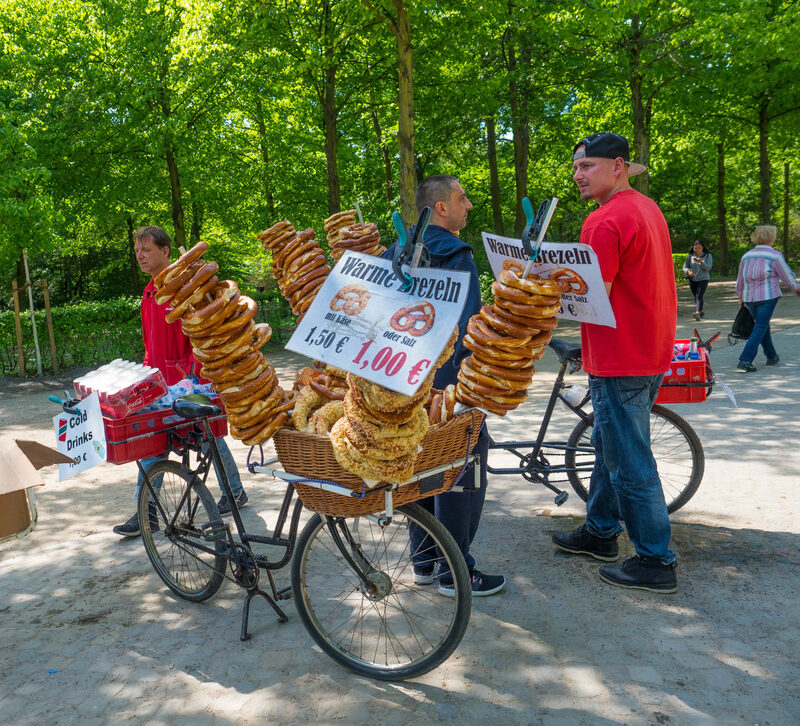 There are stalls and street vendors all around the city. Just find one and enjoy! 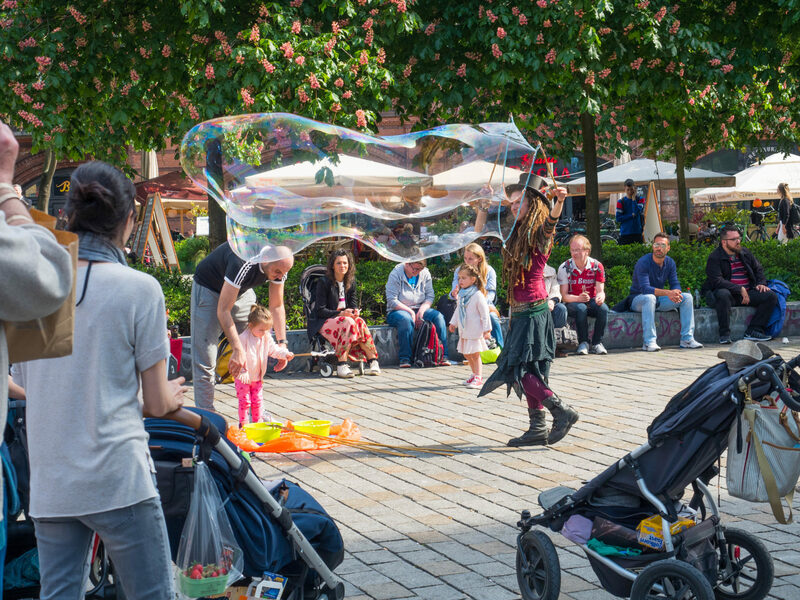 Saving the best for last, I think the best thing to do in Berlin is simply people watch. Like I said before, anything goes. 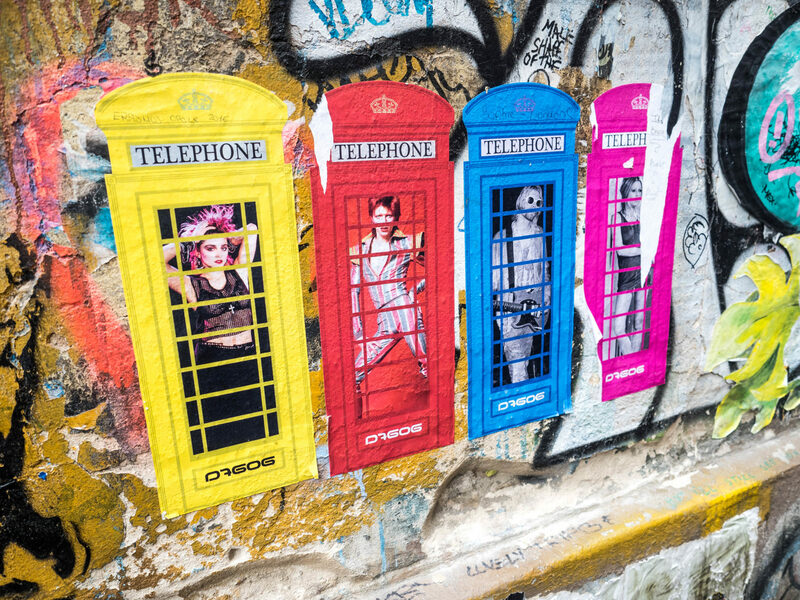 You can express yourself however you want in this city without judgment. I felt very free and welcomed here.